Η τελική επίθεση Στις 28 Μαΐου, συντελέστηκε μεγάλη ακολουθία στην Αγία Σοφία, η τελευταία χριστιανική ακολουθία που πραγματοποιήθηκε στην περίφημη εκκλησία της πόλης, την οποία παρακολούθησε πλήθος αξιωματούχων και πιστών. Ο Κωνσταντίνος ΙΑ’ σε λόγο προς τον λαό του, όπως τον διασώζει ο Γ. Φραντζής, τον προέτρεψε να αντισταθεί γενναία, λέγοντας ότι οι Τούρκοι «υποστηρίζονται από όπλα, ιππικό, πυροβολικό και την αριθμητική τους υπεροχή, εμείς όμως στηριζόμεθα πρώτα στον Θεό και Σωτήρα μας και κατόπιν στα χέρια μας και στην δύναμή μας που μας έχει χαρίσει ο ίδιος ο Θεός». Ο Κωνσταντίνος ολοκλήρωσε την ομιλία του ως εξής: «Γνωρίσατε λοιπόν τούτο: Εάν ειλικρινά υπακούσετε ό,τι σας διέταξα, ελπίζω ότι, με τη βοήθεια του Θεού, θα αποφύγουμε τη δίκαιη τιμωρία Του, που κρέμεται επάνω μας». No matter what you say it still is known as Agia Sophia and that will be forever. It will never be a mosque. Make your own mosques if you can and pray there to your god. Don’t be a fool! son of a bitchs gayreek ! AYASOFYA MOSQUE – İSTANBUL SİNCE 1453 FATİH SULTAN MEHMED!!! [..YouTube..] son of a bitchs gayreek ! AYASOFYA MOSQUE – İSTANBUL SİNCE 1453 FATİH SULTAN MEHMED!!! ГОСПОДЕ ИСУСЕ ХРИСТЕ ПОМИЛУЈ НАС ГРЕШНЕ. είναι όντως πολύ καλός . . .
[..YouTube..] είναι﻿ όντως πολύ καλός . . .
[..YouTube..] είναι όντως πολύ καλός﻿ . . .
[..YouTube..] είναι όντως πολύ καλός . .﻿ . [..YouTube..] είναι όντως πολύ﻿ καλός . . .
[..YouTube..] είναι όντως πολύ καλός .﻿ . .
[..YouTube..] είναι όντως﻿ πολύ καλός . . .
[..YouTube..] είναι όντως πολύ καλός . . .
Terirem is a nonsense syllable used to fill time in hymns. However, there are various legends ascribing it a certain meaning. One is that it was a word the Virgin Mary used in her lullabies to Christ. [..YouTube..] Terirem is a nonsense syllable used to fill time in hymns. However, there are various legends ascribing it a certain meaning. One is that it was a word the Virgin Mary used in her lullabies to Christ. [..YouTube..] Terirem is a nonsense syllable used to fill time﻿ in hymns. However, there are various legends ascribing it a certain meaning. One is that it was a word the Virgin Mary used in her lullabies to Christ. [..YouTube..] Terirem is a nonsense syllable used to fill time in hymns. However, there are various legends﻿ ascribing it a certain meaning. One is that it was a word the Virgin Mary used in her lullabies to Christ. [..YouTube..] Terirem is a nonsense syllable used to fill time in hymns. However, there are various legends ascribing it a certain meaning. One is that it﻿ was a word the Virgin Mary used in her lullabies to Christ. [..YouTube..] Terirem is a nonsense syllable used to fill time in hymns. However, there are various legends ascribing﻿ it a certain meaning. One is that it was a word the Virgin Mary used in her lullabies to Christ. [..YouTube..] Terirem is a nonsense syllable used to fill time in hymns. However, there are various legends ascribing it a certain meaning. One is that it was a word the Virgin Mary used in her lullabies to﻿ Christ. [..YouTube..] Terirem is a nonsense syllable used to fill time in hymns. However, there are various legends ascribing it a certain﻿ meaning. One is that it was a word the Virgin Mary used in her lullabies to Christ. [..YouTube..] Terirem is a nonsense﻿ syllable used to fill time in hymns. However, there are various legends ascribing it a certain meaning. One is that it was a word the Virgin Mary used in her lullabies to Christ. [..YouTube..] Terirem is a nonsense syllable used to fill time in hymns. However, there are various legends ascribing it﻿ a certain meaning. One is that it was a word the Virgin Mary used in her lullabies to Christ. [..YouTube..] Terirem is a nonsense syllable used to fill time in hymns. However, there are various legends ascribing it a certain meaning. One is that it was a﻿ word the Virgin Mary used in her lullabies to Christ. [..YouTube..] Terirem is a nonsense syllable used to fill time in﻿ hymns. However, there are various legends ascribing it a certain meaning. One is that it was a word the Virgin Mary used in her lullabies to Christ. [..YouTube..] Terirem is a nonsense syllable used to fill time in hymns. However, there are various legends ascribing it a certain meaning. One is that it was a word the Virgin Mary﻿ used in her lullabies to Christ. [..YouTube..] Terirem is a nonsense syllable used to fill time in hymns. However, there are various legends ascribing it a certain meaning. One is that it was a word the Virgin Mary used in her lullabies﻿ to Christ. [..YouTube..] Terirem is a nonsense syllable used to fill time in hymns. However, there are various﻿ legends ascribing it a certain meaning. One is that it was a word the Virgin Mary used in her lullabies to Christ. [..YouTube..] Terirem is a nonsense syllable used to fill time in hymns. However, there are various legends ascribing it a certain meaning. One is that it was﻿ a word the Virgin Mary used in her lullabies to Christ. [..YouTube..] Terirem is a nonsense syllable used to fill time in hymns. However, there are various legends ascribing it a certain meaning.﻿ One is that it was a word the Virgin Mary used in her lullabies to Christ. [..YouTube..] Terirem is a nonsense syllable used to fill time in hymns. However, there are various legends ascribing it a certain meaning. One is that﻿ it was a word the Virgin Mary used in her lullabies to Christ. [..YouTube..] Terirem is a nonsense syllable used to fill time in hymns. However,﻿ there are various legends ascribing it a certain meaning. One is that it was a word the Virgin Mary used in her lullabies to Christ. [..YouTube..] Terirem is a nonsense syllable used to fill time in hymns. However, there are various legends ascribing it a﻿ certain meaning. One is that it was a word the Virgin Mary used in her lullabies to Christ. [..YouTube..] Terirem is a nonsense syllable used to fill time in hymns. However, there are various legends ascribing it a certain meaning. One is that it was a word the Virgin Mary used in her﻿ lullabies to Christ. [..YouTube..] Terirem is a nonsense syllable used to﻿ fill time in hymns. However, there are various legends ascribing it a certain meaning. One is that it was a word the Virgin Mary used in her lullabies to Christ. [..YouTube..] Terirem is a nonsense syllable used to fill time in hymns. However, there are various legends ascribing it a certain meaning. One is that it was a word the﻿ Virgin Mary used in her lullabies to Christ. [..YouTube..] Terirem is a nonsense syllable used to fill﻿ time in hymns. However, there are various legends ascribing it a certain meaning. One is that it was a word the Virgin Mary used in her lullabies to Christ. [..YouTube..] Terirem is a nonsense syllable used to fill time in hymns. However, there are various legends ascribing it a certain meaning. One﻿ is that it was a word the Virgin Mary used in her lullabies to Christ. [..YouTube..] Terirem is a nonsense syllable used to fill time in hymns. However, there are various legends ascribing it a certain meaning. One is that it was a word the Virgin﻿ Mary used in her lullabies to Christ. [..YouTube..] Terirem is a nonsense syllable used﻿ to fill time in hymns. However, there are various legends ascribing it a certain meaning. One is that it was a word the Virgin Mary used in her lullabies to Christ. [..YouTube..] Terirem is a﻿ nonsense syllable used to fill time in hymns. However, there are various legends ascribing it a certain meaning. One is that it was a word the Virgin Mary used in her lullabies to Christ. [..YouTube..] Terirem is a nonsense syllable used to fill time in hymns. However, there are﻿ various legends ascribing it a certain meaning. One is that it was a word the Virgin Mary used in her lullabies to Christ. [..YouTube..] Terirem is a nonsense syllable used to fill time in hymns. However, there are various legends ascribing it a certain meaning. One is that it was a word﻿ the Virgin Mary used in her lullabies to Christ. [..YouTube..] Terirem is a nonsense syllable﻿ used to fill time in hymns. However, there are various legends ascribing it a certain meaning. One is that it was a word the Virgin Mary used in her lullabies to Christ. [..YouTube..] Terirem﻿ is a nonsense syllable used to fill time in hymns. However, there are various legends ascribing it a certain meaning. One is that it was a word the Virgin Mary used in her lullabies to Christ. [..YouTube..] Terirem is a nonsense syllable used to fill time in hymns. However, there are various legends ascribing it a certain meaning. One is﻿ that it was a word the Virgin Mary used in her lullabies to Christ. [..YouTube..] Terirem is a nonsense syllable used to fill time in hymns.﻿ However, there are various legends ascribing it a certain meaning. One is that it was a word the Virgin Mary used in her lullabies to Christ. [..YouTube..] Terirem is﻿ a nonsense syllable used to fill time in hymns. However, there are various legends ascribing it a certain meaning. One is that it was a word the Virgin Mary used in her lullabies to Christ. [..YouTube..] Terirem is a nonsense syllable used to fill time in hymns. However, there﻿ are various legends ascribing it a certain meaning. One is that it was a word the Virgin Mary used in her lullabies to Christ. [..YouTube..] Terirem is a nonsense syllable used to fill time in hymns. However, there are various legends ascribing it a certain meaning. One is that it was a word the Virgin Mary used in﻿ her lullabies to Christ. [..YouTube..] Terirem is a nonsense syllable used to fill time in hymns. However, there are various legends ascribing it a certain meaning. One is that it was a word the Virgin Mary used﻿ in her lullabies to Christ. This is fourth tone. Fourth tone is divided in some subcategories. This chant is chanted in a subcategory called “Hagia”. The chant is called “Logon agathon (Λόγον αγαθόν)” and it is a “Polyeleos (Πολυέλεος)”. Polyeleos is a type of chant with lyrics taken from the David’s Psalms. These lyrics are taken from Psalm 44 which is a prophecy about Mother of God. It is chanted in the Matins of Theotokos celebrations. [..YouTube..] This is fourth tone. Fourth tone is divided in some subcategories. This chant is chanted in a subcategory called “Hagia”. 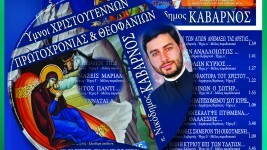 The chant is called “Logon agathon (Λόγον αγαθόν)” and it is a “Polyeleos (Πολυέλεος)”. Polyeleos is a type of chant with lyrics taken from the David’s Psalms. These lyrics are taken from Psalm 44 which is a prophecy about Mother of God. It is chanted in the Matins of Theotokos celebrations. [..YouTube..] This is fourth tone. Fourth tone is divided in some subcategories. This﻿ chant is chanted in a subcategory called “Hagia”. The chant is called “Logon agathon (Λόγον αγαθόν)” and it is a “Polyeleos (Πολυέλεος)”. Polyeleos is a type of chant with lyrics taken from the David’s Psalms. These lyrics are taken from Psalm 44 which is a prophecy about Mother of God. It is chanted in the Matins of Theotokos celebrations. [..YouTube..] This is fourth tone. Fourth tone is﻿ divided in some subcategories. This chant is chanted in a subcategory called “Hagia”. The chant is called “Logon agathon (Λόγον αγαθόν)” and it is a “Polyeleos (Πολυέλεος)”. Polyeleos is a type of chant with lyrics taken from the David’s Psalms. These lyrics are taken from Psalm 44 which is a prophecy about Mother of God. It is chanted in the Matins of Theotokos celebrations. [..YouTube..] This is fourth tone. Fourth tone is divided in some subcategories. This chant is chanted in a subcategory called “Hagia”. The chant is called “Logon agathon (Λόγον αγαθόν)” and it is a “Polyeleos (Πολυέλεος)”. Polyeleos is a type of chant with lyrics taken from the David’s Psalms. These lyrics are taken from Psalm 44 which is a prophecy about Mother﻿ of God. It is chanted in the Matins of Theotokos celebrations. [..YouTube..] This is fourth tone. Fourth tone is divided in some subcategories. This chant is chanted in a subcategory called “Hagia”. The chant is called “Logon agathon (Λόγον αγαθόν)” and it is a﻿ “Polyeleos (Πολυέλεος)”. Polyeleos is a type of chant with lyrics taken from the David’s Psalms. These lyrics are taken from Psalm 44 which is a prophecy about Mother of God. It is chanted in the Matins of Theotokos celebrations. [..YouTube..] This is fourth tone. Fourth tone is divided in﻿ some subcategories. This chant is chanted in a subcategory called “Hagia”. The chant is called “Logon agathon (Λόγον αγαθόν)” and it is a “Polyeleos (Πολυέλεος)”. Polyeleos is a type of chant with lyrics taken from the David’s Psalms. These lyrics are taken from Psalm 44 which is a prophecy about Mother of God. It is chanted in the Matins of Theotokos celebrations. [..YouTube..] This is fourth tone.﻿ Fourth tone is divided in some subcategories. This chant is chanted in a subcategory called “Hagia”. The chant is called “Logon agathon (Λόγον αγαθόν)” and it is a “Polyeleos (Πολυέλεος)”. Polyeleos is a type of chant with lyrics taken from the David’s Psalms. These lyrics are taken from Psalm 44 which is a prophecy about Mother of God. It is chanted in the Matins of Theotokos celebrations. [..YouTube..] This is fourth tone. Fourth tone is divided in some subcategories. This chant is chanted in a subcategory called “Hagia”. The chant is called “Logon agathon (Λόγον αγαθόν)” and﻿ it is a “Polyeleos (Πολυέλεος)”. Polyeleos is a type of chant with lyrics taken from the David’s Psalms. These lyrics are taken from Psalm 44 which is a prophecy about Mother of God. It is chanted in the Matins of Theotokos celebrations. [..YouTube..] This is fourth tone. Fourth tone is divided in some subcategories. This chant is chanted in a subcategory called “Hagia”. The chant is called “Logon agathon (Λόγον αγαθόν)” and it is a “Polyeleos (Πολυέλεος)”. Polyeleos is a type of chant with﻿ lyrics taken from the David’s Psalms. These lyrics are taken from Psalm 44 which is a prophecy about Mother of God. It is chanted in the Matins of Theotokos celebrations. [..YouTube..] This is fourth tone. Fourth tone is divided in some subcategories. This chant is chanted in a subcategory called “Hagia”. The chant is﻿ called “Logon agathon (Λόγον αγαθόν)” and it is a “Polyeleos (Πολυέλεος)”. Polyeleos is a type of chant with lyrics taken from the David’s Psalms. These lyrics are taken from Psalm 44 which is a prophecy about Mother of God. It is chanted in the Matins of Theotokos celebrations. [..YouTube..] This is fourth tone. Fourth tone is divided in some subcategories. This chant is chanted in a subcategory called “Hagia”. The chant is called “Logon agathon (Λόγον αγαθόν)” and it is a “Polyeleos (Πολυέλεος)”. Polyeleos is a type of chant with lyrics taken from﻿ the David’s Psalms. These lyrics are taken from Psalm 44 which is a prophecy about Mother of God. It is chanted in the Matins of Theotokos celebrations. [..YouTube..] This is fourth tone. Fourth tone is divided in some subcategories. This chant is chanted in a subcategory called “Hagia”. The chant is called “Logon agathon (Λόγον αγαθόν)” and it is a “Polyeleos (Πολυέλεος)”. Polyeleos is a type of chant with lyrics taken from the David’s Psalms. These lyrics are﻿ taken from Psalm 44 which is a prophecy about Mother of God. It is chanted in the Matins of Theotokos celebrations. [..YouTube..] This is fourth tone. Fourth tone is divided in some subcategories. This chant is chanted in a subcategory called﻿ “Hagia”. The chant is called “Logon agathon (Λόγον αγαθόν)” and it is a “Polyeleos (Πολυέλεος)”. Polyeleos is a type of chant with lyrics taken from the David’s Psalms. These lyrics are taken from Psalm 44 which is a prophecy about Mother of God. It is chanted in the Matins of Theotokos celebrations. [..YouTube..] This is fourth tone. Fourth tone is divided in some subcategories. This chant is chanted in a subcategory called “Hagia”. The chant﻿ is called “Logon agathon (Λόγον αγαθόν)” and it is a “Polyeleos (Πολυέλεος)”. Polyeleos is a type of chant with lyrics taken from the David’s Psalms. These lyrics are taken from Psalm 44 which is a prophecy about Mother of God. It is chanted in the Matins of Theotokos celebrations. [..YouTube..] This is fourth tone. Fourth tone is divided in some subcategories. This chant is chanted in a subcategory called “Hagia”. The chant is called “Logon agathon (Λόγον αγαθόν)” and it is a “Polyeleos (Πολυέλεος)”. Polyeleos is a type﻿ of chant with lyrics taken from the David’s Psalms. These lyrics are taken from Psalm 44 which is a prophecy about Mother of God. It is chanted in the Matins of Theotokos celebrations. [..YouTube..] This is fourth tone. Fourth tone﻿ is divided in some subcategories. This chant is chanted in a subcategory called “Hagia”. The chant is called “Logon agathon (Λόγον αγαθόν)” and it is a “Polyeleos (Πολυέλεος)”. Polyeleos is a type of chant with lyrics taken from the David’s Psalms. These lyrics are taken from Psalm 44 which is a prophecy about Mother of God. It is chanted in the Matins of Theotokos celebrations. [..YouTube..] This is fourth tone. Fourth tone is divided in some subcategories. This chant is chanted in a subcategory called “Hagia”. The chant is called “Logon agathon (Λόγον αγαθόν)” and it is a “Polyeleos (Πολυέλεος)”.﻿ Polyeleos is a type of chant with lyrics taken from the David’s Psalms. These lyrics are taken from Psalm 44 which is a prophecy about Mother of God. It is chanted in the Matins of Theotokos celebrations. [..YouTube..] This is fourth tone. Fourth tone is divided in some subcategories. This chant is chanted in a﻿ subcategory called “Hagia”. The chant is called “Logon agathon (Λόγον αγαθόν)” and it is a “Polyeleos (Πολυέλεος)”. Polyeleos is a type of chant with lyrics taken from the David’s Psalms. These lyrics are taken from Psalm 44 which is a prophecy about Mother of God. It is chanted in the Matins of Theotokos celebrations. [..YouTube..] This is fourth tone. Fourth tone is divided in some subcategories. This chant﻿ is chanted in a subcategory called “Hagia”. The chant is called “Logon agathon (Λόγον αγαθόν)” and it is a “Polyeleos (Πολυέλεος)”. Polyeleos is a type of chant with lyrics taken from the David’s Psalms. These lyrics are taken from Psalm 44 which is a prophecy about Mother of God. It is chanted in the Matins of Theotokos celebrations. [..YouTube..] This is fourth tone. Fourth tone is divided in some subcategories. This chant is chanted in a subcategory called “Hagia”. The chant is called “Logon agathon (Λόγον αγαθόν)” and it is a “Polyeleos (Πολυέλεος)”. Polyeleos is a type of chant with lyrics taken from the David’s Psalms. These lyrics are taken from Psalm 44 which is a﻿ prophecy about Mother of God. It is chanted in the Matins of Theotokos celebrations. [..YouTube..] This is fourth tone. Fourth tone is divided in some subcategories. This chant is chanted in a subcategory called “Hagia”. The chant is called “Logon agathon (Λόγον αγαθόν)” and it is a “Polyeleos (Πολυέλεος)”. Polyeleos is a type of chant﻿ with lyrics taken from the David’s Psalms. These lyrics are taken from Psalm 44 which is a prophecy about Mother of God. It is chanted in the Matins of Theotokos celebrations. [..YouTube..] This is fourth tone. Fourth tone is divided in some subcategories. This chant is chanted in a subcategory called “Hagia”. The chant is called “Logon agathon (Λόγον αγαθόν)” and it is a “Polyeleos (Πολυέλεος)”. Polyeleos is a type of﻿ chant with lyrics taken from the David’s Psalms. These lyrics are taken from Psalm 44 which is a prophecy about Mother of God. It is chanted in the Matins of Theotokos celebrations. [..YouTube..] This is fourth tone. Fourth tone is divided in some subcategories. This chant is chanted in a subcategory called “Hagia”. The chant is called “Logon agathon (Λόγον αγαθόν)” and it is a “Polyeleos (Πολυέλεος)”. Polyeleos is a type of chant with lyrics taken from the David’s Psalms. These lyrics are taken from Psalm 44 which is a prophecy about Mother of God.﻿ It is chanted in the Matins of Theotokos celebrations. [..YouTube..] This is fourth tone. Fourth tone is divided in some subcategories. This chant is chanted in a subcategory called “Hagia”. The chant is called “Logon agathon (Λόγον αγαθόν)” and it is a “Polyeleos (Πολυέλεος)”. Polyeleos is a type of chant with lyrics taken from the David’s﻿ Psalms. These lyrics are taken from Psalm 44 which is a prophecy about Mother of God. It is chanted in the Matins of Theotokos celebrations. [..YouTube..] This is fourth tone. Fourth tone is divided in some subcategories. This chant is chanted in a subcategory called “Hagia”. The chant is called “Logon agathon (Λόγον αγαθόν)” and it is a “Polyeleos (Πολυέλεος)”. Polyeleos is a type of chant with lyrics taken from the David’s Psalms. These lyrics are taken from Psalm 44 which is a prophecy about Mother of God. It is chanted in﻿ the Matins of Theotokos celebrations. [..YouTube..] This is fourth tone. Fourth tone is divided in some subcategories. This chant is chanted in a subcategory called “Hagia”.﻿ The chant is called “Logon agathon (Λόγον αγαθόν)” and it is a “Polyeleos (Πολυέλεος)”. Polyeleos is a type of chant with lyrics taken from the David’s Psalms. These lyrics are taken from Psalm 44 which is a prophecy about Mother of God. It is chanted in the Matins of Theotokos celebrations. [..YouTube..] This is fourth tone. Fourth tone is divided in some subcategories. This chant is chanted in a subcategory called “Hagia”. The chant is called “Logon agathon (Λόγον αγαθόν)” and it is a “Polyeleos (Πολυέλεος)”. Polyeleos is a type of chant with lyrics taken from the David’s Psalms. These lyrics are taken from Psalm 44 which is a prophecy about Mother of God. It is chanted in the Matins﻿ of Theotokos celebrations. [..YouTube..] This is fourth tone. Fourth tone is divided in some subcategories. This chant is chanted in a subcategory﻿ called “Hagia”. The chant is called “Logon agathon (Λόγον αγαθόν)” and it is a “Polyeleos (Πολυέλεος)”. Polyeleos is a type of chant with lyrics taken from the David’s Psalms. These lyrics are taken from Psalm 44 which is a prophecy about Mother of God. It is chanted in the Matins of Theotokos celebrations. [..YouTube..] This is fourth tone. Fourth tone is divided in some subcategories. This chant is chanted in a subcategory called “Hagia”. The chant is called “Logon agathon (Λόγον αγαθόν)” and it is a “Polyeleos (Πολυέλεος)”. Polyeleos is a type of chant with lyrics taken from the David’s Psalms. These lyrics are taken from Psalm 44 which is a prophecy about Mother of﻿ God. It is chanted in the Matins of Theotokos celebrations. [..YouTube..] This is fourth tone. Fourth tone is divided in some subcategories. This chant is chanted in a subcategory called “Hagia”. The chant is called “Logon agathon (Λόγον αγαθόν)”﻿ and it is a “Polyeleos (Πολυέλεος)”. Polyeleos is a type of chant with lyrics taken from the David’s Psalms. These lyrics are taken from Psalm 44 which is a prophecy about Mother of God. It is chanted in the Matins of Theotokos celebrations. [..YouTube..] This is fourth tone. Fourth tone is divided in some subcategories. This chant is chanted in a subcategory called “Hagia”. The chant is called “Logon agathon (Λόγον αγαθόν)” and it is a “Polyeleos (Πολυέλεος)”. Polyeleos is a type of chant with lyrics taken from the David’s Psalms. These lyrics are taken from Psalm 44 which is a prophecy about Mother of God. It is chanted﻿ in the Matins of Theotokos celebrations. [..YouTube..] This is fourth tone. Fourth tone is divided in some subcategories. This chant is chanted in a subcategory called “Hagia”. The chant is called “Logon agathon (Λόγον αγαθόν)” and it is a “Polyeleos (Πολυέλεος)”. Polyeleos is a﻿ type of chant with lyrics taken from the David’s Psalms. These lyrics are taken from Psalm 44 which is a prophecy about Mother of God. It is chanted in the Matins of Theotokos celebrations. [..YouTube..] This is fourth tone. Fourth tone is divided in some subcategories. This chant is chanted in a subcategory called “Hagia”. The chant is called “Logon agathon (Λόγον αγαθόν)” and it is a “Polyeleos (Πολυέλεος)”. Polyeleos is﻿ a type of chant with lyrics taken from the David’s Psalms. These lyrics are taken from Psalm 44 which is a prophecy about Mother of God. It is chanted in the Matins of Theotokos celebrations. [..YouTube..] This is fourth tone. Fourth tone is divided in some subcategories. This chant is chanted in a subcategory called “Hagia”. The chant is called “Logon agathon (Λόγον αγαθόν)” and it is a “Polyeleos (Πολυέλεος)”. Polyeleos is a type of chant with lyrics﻿ taken from the David’s Psalms. These lyrics are taken from Psalm 44 which is a prophecy about Mother of God. It is chanted in the Matins of Theotokos celebrations. [..YouTube..] This is fourth tone. Fourth tone is divided in some subcategories. This chant is chanted in a subcategory called “Hagia”. The chant is called “Logon agathon (Λόγον αγαθόν)” and it is a “Polyeleos (Πολυέλεος)”. Polyeleos is a type of chant with lyrics taken from the David’s Psalms. These lyrics are taken from Psalm 44 which is a prophecy about Mother of God. It is chanted in the Matins of﻿ Theotokos celebrations. [..YouTube..] This is fourth tone. Fourth tone is divided in some subcategories. This chant is chanted in a subcategory called “Hagia”. The chant is called “Logon agathon (Λόγον αγαθόν)” and it is a “Polyeleos (Πολυέλεος)”. Polyeleos is a type of chant with lyrics taken from the David’s Psalms. These lyrics﻿ are taken from Psalm 44 which is a prophecy about Mother of God. It is chanted in the Matins of Theotokos celebrations. [..YouTube..] This is fourth tone. Fourth tone is divided in some subcategories. This chant is chanted in a subcategory called “Hagia”. The chant is called “Logon agathon (Λόγον αγαθόν)” and it is a “Polyeleos (Πολυέλεος)”. Polyeleos is a type of chant with lyrics taken from the David’s Psalms. These lyrics are taken from Psalm 44 which is a prophecy about Mother of God. It is chanted in the﻿ Matins of Theotokos celebrations. [..YouTube..] This is fourth tone. Fourth tone is divided in some subcategories. This chant is chanted in﻿ a subcategory called “Hagia”. The chant is called “Logon agathon (Λόγον αγαθόν)” and it is a “Polyeleos (Πολυέλεος)”. Polyeleos is a type of chant with lyrics taken from the David’s Psalms. These lyrics are taken from Psalm 44 which is a prophecy about Mother of God. It is chanted in the Matins of Theotokos celebrations. [..YouTube..] This is fourth tone. Fourth tone is divided in some subcategories. This chant is chanted in a subcategory called “Hagia”. The chant is called “Logon agathon (Λόγον﻿ αγαθόν)” and it is a “Polyeleos (Πολυέλεος)”. Polyeleos is a type of chant with lyrics taken from the David’s Psalms. These lyrics are taken from Psalm 44 which is a prophecy about Mother of God. It is chanted in the Matins of Theotokos celebrations. [..YouTube..] This is fourth tone. Fourth tone is divided in some subcategories. This chant is chanted in a subcategory called “Hagia”. The chant is called “Logon agathon (Λόγον αγαθόν)” and it﻿ is a “Polyeleos (Πολυέλεος)”. Polyeleos is a type of chant with lyrics taken from the David’s Psalms. These lyrics are taken from Psalm 44 which is a prophecy about Mother of God. It is chanted in the Matins of Theotokos celebrations. [..YouTube..] This is fourth tone. Fourth tone is divided in some subcategories. This chant is chanted in a subcategory called “Hagia”. The chant is called “Logon agathon (Λόγον αγαθόν)” and it is a “Polyeleos (Πολυέλεος)”. Polyeleos is a type of chant with lyrics taken from the David’s Psalms. These lyrics are taken﻿ from Psalm 44 which is a prophecy about Mother of God. It is chanted in the Matins of Theotokos celebrations. [..YouTube..] This is fourth tone. Fourth tone is divided in some subcategories. This chant is chanted in a subcategory called “Hagia”. The chant is called “Logon agathon (Λόγον αγαθόν)” and it is a “Polyeleos (Πολυέλεος)”. Polyeleos is a type of chant with lyrics taken from the David’s Psalms. These lyrics are taken from Psalm 44 which is a prophecy﻿ about Mother of God. It is chanted in the Matins of Theotokos celebrations. [..YouTube..] This is fourth tone. Fourth tone is divided in some subcategories. This chant is chanted in a subcategory called “Hagia”. The chant is called “Logon agathon (Λόγον αγαθόν)” and it is a “Polyeleos (Πολυέλεος)”. Polyeleos is a type of chant with lyrics taken from the﻿ David’s Psalms. These lyrics are taken from Psalm 44 which is a prophecy about Mother of God. It is chanted in the Matins of Theotokos celebrations. [..YouTube..] This is fourth tone. Fourth tone is divided in some subcategories. This chant is chanted in a subcategory called “Hagia”. The chant is called “Logon﻿ agathon (Λόγον αγαθόν)” and it is a “Polyeleos (Πολυέλεος)”. Polyeleos is a type of chant with lyrics taken from the David’s Psalms. These lyrics are taken from Psalm 44 which is a prophecy about Mother of God. It is chanted in the Matins of Theotokos celebrations. [..YouTube..] This is fourth tone. Fourth tone is divided in some subcategories. This chant is chanted in a subcategory called “Hagia”. The chant is called “Logon agathon (Λόγον αγαθόν)” and it is a “Polyeleos (Πολυέλεος)”. Polyeleos is a type of chant with lyrics taken from the David’s Psalms. These lyrics are taken from Psalm 44 which﻿ is a prophecy about Mother of God. It is chanted in the Matins of Theotokos celebrations. [..YouTube..] This is fourth tone. Fourth tone is divided in some subcategories. This chant is chanted in a subcategory called “Hagia”. The chant is called “Logon agathon (Λόγον αγαθόν)” and it is a “Polyeleos (Πολυέλεος)”. Polyeleos is a type of chant with lyrics taken from the David’s Psalms.﻿ These lyrics are taken from Psalm 44 which is a prophecy about Mother of God. It is chanted in the Matins of Theotokos celebrations. [..YouTube..] This﻿ is fourth tone. Fourth tone is divided in some subcategories. This chant is chanted in a subcategory called “Hagia”. The chant is called “Logon agathon (Λόγον αγαθόν)” and it is a “Polyeleos (Πολυέλεος)”. Polyeleos is a type of chant with lyrics taken from the David’s Psalms. These lyrics are taken from Psalm 44 which is a prophecy about Mother of God. It is chanted in the Matins of Theotokos celebrations. [..YouTube..] This is fourth tone. Fourth tone is divided in some subcategories. This chant is chanted﻿ in a subcategory called “Hagia”. The chant is called “Logon agathon (Λόγον αγαθόν)” and it is a “Polyeleos (Πολυέλεος)”. Polyeleos is a type of chant with lyrics taken from the David’s Psalms. These lyrics are taken from Psalm 44 which is a prophecy about Mother of God. It is chanted in the Matins of Theotokos celebrations. [..YouTube..] This is fourth tone. Fourth tone is divided in some subcategories. This chant is chanted in a subcategory called “Hagia”. The chant is called “Logon agathon (Λόγον αγαθόν)” and it is a “Polyeleos (Πολυέλεος)”. Polyeleos is a type of chant with lyrics taken from the David’s Psalms. These lyrics are taken from Psalm﻿ 44 which is a prophecy about Mother of God. It is chanted in the Matins of Theotokos celebrations. [..YouTube..] This is fourth tone. Fourth tone is divided in some subcategories. This chant is chanted in a subcategory called “Hagia”. The chant is called “Logon agathon (Λόγον αγαθόν)” and it is a “Polyeleos (Πολυέλεος)”. Polyeleos is a type of chant with lyrics taken﻿ from the David’s Psalms. These lyrics are taken from Psalm 44 which is a prophecy about Mother of God. It is chanted in the Matins of Theotokos celebrations. [..YouTube..] This is fourth tone. Fourth tone is divided in some subcategories. This chant is chanted in a subcategory called “Hagia”. The chant is called “Logon agathon (Λόγον αγαθόν)” and it is﻿ a “Polyeleos (Πολυέλεος)”. Polyeleos is a type of chant with lyrics taken from the David’s Psalms. These lyrics are taken from Psalm 44 which is a prophecy about Mother of God. It is chanted in the Matins of Theotokos celebrations. [..YouTube..] This is fourth tone. Fourth tone is divided in some subcategories. This chant is chanted in a subcategory called “Hagia”. The chant is called “Logon agathon (Λόγον αγαθόν)” and it is a “Polyeleos (Πολυέλεος)”. Polyeleos is a type of chant with lyrics taken from the David’s Psalms. These lyrics are taken from Psalm 44 which is a prophecy about Mother of God. It is﻿ chanted in the Matins of Theotokos celebrations. [..YouTube..] This is﻿ fourth tone. Fourth tone is divided in some subcategories. This chant is chanted in a subcategory called “Hagia”. The chant is called “Logon agathon (Λόγον αγαθόν)” and it is a “Polyeleos (Πολυέλεος)”. Polyeleos is a type of chant with lyrics taken from the David’s Psalms. These lyrics are taken from Psalm 44 which is a prophecy about Mother of God. It is chanted in the Matins of Theotokos celebrations. [..YouTube..] This is fourth tone. Fourth tone is divided in some subcategories. This chant is chanted in a subcategory called “Hagia”. The chant is called “Logon agathon (Λόγον αγαθόν)” and it is a “Polyeleos﻿ (Πολυέλεος)”. Polyeleos is a type of chant with lyrics taken from the David’s Psalms. These lyrics are taken from Psalm 44 which is a prophecy about Mother of God. It is chanted in the Matins of Theotokos celebrations. [..YouTube..] This is fourth tone. Fourth tone is divided in some subcategories. This chant is chanted in a subcategory called “Hagia”. The chant is called “Logon agathon (Λόγον αγαθόν)” and it is a “Polyeleos (Πολυέλεος)”. Polyeleos is a type of chant with lyrics taken from the David’s Psalms. These lyrics are taken from﻿ Psalm 44 which is a prophecy about Mother of God. It is chanted in the Matins of Theotokos celebrations. [..YouTube..] This is fourth tone. Fourth tone is divided in some subcategories. This chant is chanted in a subcategory called “Hagia”. The chant is called﻿ “Logon agathon (Λόγον αγαθόν)” and it is a “Polyeleos (Πολυέλεος)”. Polyeleos is a type of chant with lyrics taken from the David’s Psalms. These lyrics are taken from Psalm 44 which is a prophecy about Mother of God. It is chanted in the Matins of Theotokos celebrations. [..YouTube..] This is fourth tone. Fourth tone is divided in some subcategories. This chant is chanted in a subcategory called “Hagia”. The chant is called “Logon agathon (Λόγον αγαθόν)” and it is a “Polyeleos (Πολυέλεος)”. Polyeleos is a type of chant with lyrics taken from the David’s Psalms. These﻿ lyrics are taken from Psalm 44 which is a prophecy about Mother of God. It is chanted in the Matins of Theotokos celebrations. [..YouTube..] This is fourth tone. Fourth tone is divided in some subcategories.﻿ This chant is chanted in a subcategory called “Hagia”. The chant is called “Logon agathon (Λόγον αγαθόν)” and it is a “Polyeleos (Πολυέλεος)”. Polyeleos is a type of chant with lyrics taken from the David’s Psalms. These lyrics are taken from Psalm 44 which is a prophecy about Mother of God. It is chanted in the Matins of Theotokos celebrations. [..YouTube..] This is fourth tone. Fourth tone is divided﻿ in some subcategories. This chant is chanted in a subcategory called “Hagia”. The chant is called “Logon agathon (Λόγον αγαθόν)” and it is a “Polyeleos (Πολυέλεος)”. Polyeleos is a type of chant with lyrics taken from the David’s Psalms. These lyrics are taken from Psalm 44 which is a prophecy about Mother of God. It is chanted in the Matins of Theotokos celebrations. [..YouTube..] This is fourth tone. Fourth tone is divided in some subcategories. This chant is﻿ chanted in a subcategory called “Hagia”. The chant is called “Logon agathon (Λόγον αγαθόν)” and it is a “Polyeleos (Πολυέλεος)”. Polyeleos is a type of chant with lyrics taken from the David’s Psalms. These lyrics are taken from Psalm 44 which is a prophecy about Mother of God. It is chanted in the Matins of Theotokos celebrations. [..YouTube..] This is fourth tone. Fourth tone is divided in some subcategories. This chant is chanted in a subcategory called “Hagia”. The chant is called “Logon agathon (Λόγον αγαθόν)” and it is a “Polyeleos (Πολυέλεος)”. Polyeleos is a type of chant with lyrics taken from the David’s Psalms. These lyrics are taken from Psalm 44 which is a prophecy about﻿ Mother of God. It is chanted in the Matins of Theotokos celebrations. [..YouTube..] This is fourth tone. Fourth tone is divided in some subcategories. This chant is chanted in a subcategory called “Hagia”. The chant is called “Logon agathon﻿ (Λόγον αγαθόν)” and it is a “Polyeleos (Πολυέλεος)”. Polyeleos is a type of chant with lyrics taken from the David’s Psalms. These lyrics are taken from Psalm 44 which is a prophecy about Mother of God. It is chanted in the Matins of Theotokos celebrations. bravo oh Theos na sei evlogisi Pater. [..YouTube..] bravo oh﻿ Theos na sei evlogisi Pater. [..YouTube..] bravo oh Theos﻿ na sei evlogisi Pater. [..YouTube..] bravo oh Theos na sei evlogisi﻿ Pater. [..YouTube..] bravo oh Theos na﻿ sei evlogisi Pater. [..YouTube..] bravo oh Theos na sei﻿ evlogisi Pater. [..YouTube..] bravo﻿ oh Theos na sei evlogisi Pater. [..YouTube..] bravo oh Theos na sei evlogisi Pater. [..YouTube..] Den﻿ xorteno n’akouo ke na vlepo ola afta ta videos me ton katapliktiko afto psalti.S’egfharistoume yia ta videos afta ke o Theos mazi mas ke na evlogei olokliro to kosmo panta. [..YouTube..] Den xorteno n’akouo ke na vlepo ola afta ta videos me ton katapliktiko afto psalti.S’egfharistoume yia ta videos afta ke o Theos mazi mas ke na evlogei olokliro﻿ to kosmo panta. [..YouTube..] Den xorteno n’akouo ke na vlepo ola afta ta videos me ton katapliktiko afto psalti.S’egfharistoume yia﻿ ta videos afta ke o Theos mazi mas ke na evlogei olokliro to kosmo panta. [..YouTube..] Den xorteno n’akouo﻿ ke na vlepo ola afta ta videos me ton katapliktiko afto psalti.S’egfharistoume yia ta videos afta ke o Theos mazi mas ke na evlogei olokliro to kosmo panta. [..YouTube..] Den xorteno n’akouo ke na vlepo ola afta ta videos me ton katapliktiko afto psalti.S’egfharistoume yia ta videos afta ke o Theos mazi mas﻿ ke na evlogei olokliro to kosmo panta. [..YouTube..] Den xorteno n’akouo ke na vlepo ola afta ta videos me ton katapliktiko afto psalti.S’egfharistoume yia ta videos afta ke﻿ o Theos mazi mas ke na evlogei olokliro to kosmo panta. [..YouTube..] Den xorteno n’akouo ke na vlepo ola afta ta videos me ton katapliktiko afto psalti.S’egfharistoume yia ta videos afta ke o Theos mazi mas ke na evlogei olokliro to﻿ kosmo panta. [..YouTube..] Den xorteno n’akouo ke na vlepo ola afta ta videos﻿ me ton katapliktiko afto psalti.S’egfharistoume yia ta videos afta ke o Theos mazi mas ke na evlogei olokliro to kosmo panta. [..YouTube..] Den xorteno n’akouo ke na vlepo ola afta ta videos me ton katapliktiko﻿ afto psalti.S’egfharistoume yia ta videos afta ke o Theos mazi mas ke na evlogei olokliro to kosmo panta. [..YouTube..] Den xorteno n’akouo ke na﻿ vlepo ola afta ta videos me ton katapliktiko afto psalti.S’egfharistoume yia ta videos afta ke o Theos mazi mas ke na evlogei olokliro to kosmo panta. [..YouTube..] Den xorteno n’akouo ke na vlepo ola afta ta videos me ton katapliktiko afto﻿ psalti.S’egfharistoume yia ta videos afta ke o Theos mazi mas ke na evlogei olokliro to kosmo panta. [..YouTube..] Den xorteno n’akouo ke na vlepo ola afta ta videos me ton katapliktiko afto psalti.S’egfharistoume yia ta videos afta ke o Theos mazi﻿ mas ke na evlogei olokliro to kosmo panta. [..YouTube..] Den xorteno n’akouo ke na vlepo ola afta ta videos me ton﻿ katapliktiko afto psalti.S’egfharistoume yia ta videos afta ke o Theos mazi mas ke na evlogei olokliro to kosmo panta. [..YouTube..] Den xorteno n’akouo ke na vlepo ola afta ta videos me ton katapliktiko afto psalti.S’egfharistoume﻿ yia ta videos afta ke o Theos mazi mas ke na evlogei olokliro to kosmo panta. [..YouTube..] Den xorteno n’akouo ke na vlepo ola afta ta videos me ton katapliktiko afto psalti.S’egfharistoume yia ta videos afta ke o Theos mazi mas ke na evlogei﻿ olokliro to kosmo panta. [..YouTube..] Den xorteno n’akouo ke na vlepo ola afta ta videos me ton katapliktiko afto psalti.S’egfharistoume yia ta videos afta ke o Theos mazi mas ke na﻿ evlogei olokliro to kosmo panta. [..YouTube..] Den xorteno n’akouo ke na vlepo﻿ ola afta ta videos me ton katapliktiko afto psalti.S’egfharistoume yia ta videos afta ke o Theos mazi mas ke na evlogei olokliro to kosmo panta. [..YouTube..] Den xorteno n’akouo ke﻿ na vlepo ola afta ta videos me ton katapliktiko afto psalti.S’egfharistoume yia ta videos afta ke o Theos mazi mas ke na evlogei olokliro to kosmo panta. [..YouTube..] Den xorteno n’akouo ke na vlepo ola afta ta videos me ton katapliktiko afto psalti.S’egfharistoume yia ta videos afta ke o Theos﻿ mazi mas ke na evlogei olokliro to kosmo panta. [..YouTube..] Den xorteno n’akouo ke na vlepo ola afta ta videos me ton katapliktiko afto psalti.S’egfharistoume yia ta﻿ videos afta ke o Theos mazi mas ke na evlogei olokliro to kosmo panta. [..YouTube..] Den xorteno n’akouo ke na vlepo ola afta ta videos me ton katapliktiko afto psalti.S’egfharistoume yia ta videos﻿ afta ke o Theos mazi mas ke na evlogei olokliro to kosmo panta. [..YouTube..] Den xorteno﻿ n’akouo ke na vlepo ola afta ta videos me ton katapliktiko afto psalti.S’egfharistoume yia ta videos afta ke o Theos mazi mas ke na evlogei olokliro to kosmo panta. [..YouTube..] Den xorteno n’akouo ke na vlepo ola afta ta videos me ton katapliktiko afto psalti.S’egfharistoume yia ta videos afta ke o﻿ Theos mazi mas ke na evlogei olokliro to kosmo panta. [..YouTube..] Den xorteno n’akouo ke na vlepo ola afta ta videos me ton katapliktiko afto psalti.S’egfharistoume yia ta videos afta﻿ ke o Theos mazi mas ke na evlogei olokliro to kosmo panta. [..YouTube..] Den xorteno n’akouo ke na vlepo ola afta ta videos me ton katapliktiko afto psalti.S’egfharistoume yia ta videos afta ke o Theos mazi mas ke na evlogei olokliro to kosmo﻿ panta. [..YouTube..] Den xorteno n’akouo ke na vlepo ola afta ta videos me ton katapliktiko afto psalti.S’egfharistoume yia ta videos afta ke o Theos mazi mas ke﻿ na evlogei olokliro to kosmo panta. [..YouTube..] Den xorteno n’akouo ke na vlepo ola﻿ afta ta videos me ton katapliktiko afto psalti.S’egfharistoume yia ta videos afta ke o Theos mazi mas ke na evlogei olokliro to kosmo panta. [..YouTube..] Den xorteno n’akouo ke na vlepo ola afta ta videos me﻿ ton katapliktiko afto psalti.S’egfharistoume yia ta videos afta ke o Theos mazi mas ke na evlogei olokliro to kosmo panta. [..YouTube..] Den xorteno n’akouo ke na vlepo ola afta﻿ ta videos me ton katapliktiko afto psalti.S’egfharistoume yia ta videos afta ke o Theos mazi mas ke na evlogei olokliro to kosmo panta. [..YouTube..] Den xorteno n’akouo ke na vlepo ola afta ta﻿ videos me ton katapliktiko afto psalti.S’egfharistoume yia ta videos afta ke o Theos mazi mas ke na evlogei olokliro to kosmo panta. [..YouTube..] Den xorteno n’akouo ke na vlepo ola afta ta videos me ton katapliktiko afto psalti.S’egfharistoume yia ta videos afta ke o Theos mazi mas ke na evlogei olokliro to kosmo panta. My God ††† ! hearing to this Chant I was wondering where I,m , on earth or in Heaven . what tone is that ? [..YouTube..] My God ††† ! hearing to this Chant I was wondering where I,m , on earth or in Heaven﻿ . what tone is that ? [..YouTube..] My God ††† ! hearing to this Chant I was wondering where I,m , on earth or in Heaven . what tone is﻿ that ? [..YouTube..] My God ††† ! hearing to this Chant﻿ I was wondering where I,m , on earth or in Heaven . what tone is that ? [..YouTube..] My God ††† ! hearing to this Chant I was wondering where I,m , on﻿ earth or in Heaven . what tone is that ? [..YouTube..] My God ††† ! hearing to this Chant ﻿ I was wondering where I,m , on earth or in Heaven . what tone is that ? [..YouTube..] My God ††† ! hearing to this Chant I was wondering where I,m ,﻿ on earth or in Heaven . what tone is that ? [..YouTube..] My God ††† ! hearing to this Chant I was﻿ wondering where I,m , on earth or in Heaven . what tone is that ? [..YouTube..] My God ††† ! hearing to this Chant I was wondering﻿ where I,m , on earth or in Heaven . what tone is that ? [..YouTube..] My God ††† ! hearing to this Chant I was wondering where I,m , on earth or in Heaven . what tone is that﻿ ? [..YouTube..] My God ††† ! hearing to this Chant I was wondering where I,m , on earth or in Heaven . what tone﻿ is that ? [..YouTube..] My God ††† ! hearing to﻿ this Chant I was wondering where I,m , on earth or in Heaven . what tone is that ? [..YouTube..] My God ††† ﻿ ! hearing to this Chant I was wondering where I,m , on earth or in Heaven . what tone is that ? [..YouTube..] My God ††† ! hearing to this Chant I was wondering where I,m , on earth or in Heaven . ﻿ what tone is that ? [..YouTube..] My God﻿ ††† ! hearing to this Chant I was wondering where I,m , on earth or in Heaven . what tone is that ? [..YouTube..] My God ††† ! hearing to this Chant I was wondering where I,m , on earth or﻿ in Heaven . what tone is that ? [..YouTube..] My God ††† ! hearing﻿ to this Chant I was wondering where I,m , on earth or in Heaven . what tone is that ? [..YouTube..] My﻿ God ††† ! hearing to this Chant I was wondering where I,m , on earth or in Heaven . what tone is that ? [..YouTube..] My God ††† ! hearing to this Chant I was wondering where I,m﻿ , on earth or in Heaven . what tone is that ? [..YouTube..] My God ††† ! hearing to this Chant I was wondering where I,m , on earth﻿ or in Heaven . what tone is that ? [..YouTube..] My God ††† ! hearing to this﻿ Chant I was wondering where I,m , on earth or in Heaven . what tone is that ? [..YouTube..] My God ††† !﻿ hearing to this Chant I was wondering where I,m , on earth or in Heaven . what tone is that ? [..YouTube..] My God ††† ! hearing to this Chant I was wondering where I,m , on earth or in Heaven .﻿ what tone is that ? [..YouTube..] My God ††† ! ﻿ hearing to this Chant I was wondering where I,m , on earth or in Heaven . what tone is that ? [..YouTube..] My God ††† ! hearing to this Chant I was wondering where I,m , on earth or in ﻿ Heaven . what tone is that ? [..YouTube..] My God †††﻿ ! hearing to this Chant I was wondering where I,m , on earth or in Heaven . what tone is that ? [..YouTube..] My God ††† ! hearing to this Chant I﻿ was wondering where I,m , on earth or in Heaven . what tone is that ? [..YouTube..] My God ††† ! hearing ﻿ to this Chant I was wondering where I,m , on earth or in Heaven . what tone is that ? [..YouTube..] My God ††† ! hearing to this Chant I was wondering where I,m , on earth or in Heaven . what﻿ tone is that ? [..YouTube..] My God ††† ! hearing to this Chant I was wondering where I,m , on earth or in Heaven . what ﻿ tone is that ? [..YouTube..] My God ††† ! hearing to this Chant I was wondering where I,m , on earth or in﻿ Heaven . what tone is that ? [..YouTube..] My God ††† ! hearing to this Chant I was wondering where﻿ I,m , on earth or in Heaven . what tone is that ? [..YouTube..] My God ††† ! hearing to this Chant I was wondering where I,m , on earth or in Heaven . what tone is that ? 8elw na psalnoume sthn Agia Sofia >? 8ee moy pote ? [..YouTube..] 8elw na psalnoume sthn Agia Sofia >? ﻿ 8ee moy pote ? [..YouTube..] 8elw﻿ na psalnoume sthn Agia Sofia >? 8ee moy pote ? [..YouTube..] 8elw na psalnoume sthn Agia Sofia >? 8ee moy﻿ pote ? [..YouTube..] 8elw na psalnoume sthn Agia﻿ Sofia >? 8ee moy pote ? [..YouTube..] 8elw na psalnoume sthn﻿ Agia Sofia >? 8ee moy pote ? [..YouTube..] 8elw na psalnoume sthn Agia Sofia >? 8ee moy pote﻿ ? [..YouTube..] 8elw na psalnoume sthn Agia Sofia >? 8ee﻿ moy pote ? [..YouTube..] 8elw na psalnoume sthn Agia Sofia >?﻿ 8ee moy pote ? [..YouTube..] 8elw na﻿ psalnoume sthn Agia Sofia >? 8ee moy pote ? [..YouTube..] 8elw na psalnoume﻿ sthn Agia Sofia >? 8ee moy pote ? [..YouTube..] 8elw na psalnoume sthn Agia Sofia﻿ >? 8ee moy pote ? [..YouTube..] 8elw na psalnoume sthn Agia Sofia >? 8ee moy pote ? [..YouTube..] 8elw na psalnoume sthn Agia Sofia >? [..YouTube..] So…what does te ri rem﻿ mean?? [..YouTube..] So…what does te﻿ ri rem mean?? [..YouTube..] So…what﻿ does te ri rem mean?? [..YouTube..] So…what does﻿ te ri rem mean?? [..YouTube..] So…what does te ri﻿ rem mean?? [..YouTube..] So…what does te ri rem mean?? Α Ξ Ι Ο Σ!!!!!!!! [..YouTube..] Α﻿ Ξ Ι Ο Σ!!!!!!!! [..YouTube..] Α Ξ﻿ Ι Ο Σ!!!!!!!! [..YouTube..] Α Ξ Ι﻿ Ο Σ!!!!!!!! [..YouTube..] Α Ξ Ι Ο﻿ Σ!!!!!!!! [..YouTube..] Α Ξ Ι Ο Σ!!!!!!!! [..YouTube..] πολύ ψηλά,﻿ συγχαρητήρια …..
[..YouTube..] πολύ ψηλά, συγχαρητήρια﻿ …..
[..YouTube..] πολύ﻿ ψηλά, συγχαρητήρια …..
[..YouTube..] πολύ ψηλά, συγχαρητήρια …..
χριστέ μου, γιατί μας πονάν ακόμα αυτά τα πράγματα? [..YouTube..] χριστέ μου, γιατί μας πονάν ακόμα αυτά τα πράγματα? [..YouTube..] χριστέ μου,﻿ γιατί μας πονάν ακόμα αυτά τα πράγματα? [..YouTube..] χριστέ μου, γιατί μας πονάν ακόμα﻿ αυτά τα πράγματα? [..YouTube..] χριστέ μου, γιατί﻿ μας πονάν ακόμα αυτά τα πράγματα? [..YouTube..] χριστέ μου, γιατί μας πονάν﻿ ακόμα αυτά τα πράγματα? [..YouTube..] χριστέ μου, γιατί μας πονάν ακόμα αυτά τα﻿ πράγματα? [..YouTube..] χριστέ μου, γιατί μας﻿ πονάν ακόμα αυτά τα πράγματα? [..YouTube..] χριστέ﻿ μου, γιατί μας πονάν ακόμα αυτά τα πράγματα? [..YouTube..] χριστέ μου, γιατί μας πονάν ακόμα αυτά﻿ τα πράγματα? [..YouTube..] Wraios O P. Nikodhmos . O isokraths einai o psifiakos? An nai einai , exete pesasei kainoyrgies fwnes (nea samples)?﻿ Einai poly wraios o hxos twn isokrathmatwn kai endiaferomai an einai kainoyrgia samples. Bravo pater an kai den se gnwrizw. [..YouTube..] Wraios O P. Nikodhmos . O isokraths einai o psifiakos? An nai einai , exete pesasei kainoyrgies fwnes (nea samples)? Einai poly wraios o hxos twn isokrathmatwn kai endiaferomai an einai kainoyrgia samples. Bravo pater﻿ an kai den se gnwrizw. [..YouTube..] Wraios O P. Nikodhmos . O isokraths einai o psifiakos? An nai einai , exete pesasei kainoyrgies fwnes (nea samples)? Einai poly wraios o﻿ hxos twn isokrathmatwn kai endiaferomai an einai kainoyrgia samples. Bravo pater an kai den se gnwrizw. [..YouTube..] Wraios O P. Nikodhmos . O isokraths einai o psifiakos? An nai einai﻿ , exete pesasei kainoyrgies fwnes (nea samples)? Einai poly wraios o hxos twn isokrathmatwn kai endiaferomai an einai kainoyrgia samples. Bravo pater an kai den se gnwrizw. [..YouTube..] Wraios O P. Nikodhmos . O isokraths einai o psifiakos? An nai einai , exete pesasei kainoyrgies fwnes (nea samples)? Einai poly wraios o hxos twn isokrathmatwn﻿ kai endiaferomai an einai kainoyrgia samples. Bravo pater an kai den se gnwrizw. [..YouTube..] Wraios O P. Nikodhmos . O isokraths einai o psifiakos? An nai﻿ einai , exete pesasei kainoyrgies fwnes (nea samples)? Einai poly wraios o hxos twn isokrathmatwn kai endiaferomai an einai kainoyrgia samples. Bravo pater an kai den se gnwrizw. [..YouTube..] Wraios O P. Nikodhmos . O isokraths einai o psifiakos? An nai einai , exete pesasei kainoyrgies fwnes (nea samples)? Einai poly wraios o hxos twn isokrathmatwn kai endiaferomai﻿ an einai kainoyrgia samples. Bravo pater an kai den se gnwrizw. [..YouTube..] Wraios O P. Nikodhmos . O isokraths﻿ einai o psifiakos? An nai einai , exete pesasei kainoyrgies fwnes (nea samples)? Einai poly wraios o hxos twn isokrathmatwn kai endiaferomai an einai kainoyrgia samples. Bravo pater an kai den se gnwrizw. [..YouTube..] Wraios O﻿ P. Nikodhmos . O isokraths einai o psifiakos? An nai einai , exete pesasei kainoyrgies fwnes (nea samples)? Einai poly wraios o hxos twn isokrathmatwn kai endiaferomai an einai kainoyrgia samples. Bravo pater an kai den se gnwrizw. [..YouTube..] Wraios O P.﻿ Nikodhmos . O isokraths einai o psifiakos? An nai einai , exete pesasei kainoyrgies fwnes (nea samples)? Einai poly wraios o hxos twn isokrathmatwn kai endiaferomai an einai kainoyrgia samples. Bravo pater an kai den se gnwrizw. [..YouTube..] Wraios O P. Nikodhmos . O isokraths einai o psifiakos? An nai einai , exete pesasei kainoyrgies fwnes (nea samples)? Einai poly wraios o hxos twn isokrathmatwn kai endiaferomai an einai kainoyrgia samples.﻿ Bravo pater an kai den se gnwrizw. [..YouTube..] Wraios O P. Nikodhmos . O isokraths einai o psifiakos? An nai einai , exete pesasei kainoyrgies fwnes (nea samples)? Einai poly wraios o hxos twn isokrathmatwn kai endiaferomai an einai kainoyrgia samples. Bravo pater an kai den﻿ se gnwrizw. [..YouTube..] Wraios O P. Nikodhmos . O isokraths einai o psifiakos? An nai einai , exete pesasei kainoyrgies fwnes (nea samples)? Einai poly wraios o hxos twn isokrathmatwn kai﻿ endiaferomai an einai kainoyrgia samples. Bravo pater an kai den se gnwrizw. [..YouTube..] Wraios O P. Nikodhmos . O isokraths einai o psifiakos? An nai einai , exete pesasei kainoyrgies fwnes (nea samples)? Einai poly wraios o hxos twn isokrathmatwn kai endiaferomai an einai﻿ kainoyrgia samples. Bravo pater an kai den se gnwrizw. [..YouTube..] Wraios O P. Nikodhmos . O isokraths einai o psifiakos? An nai einai , exete pesasei kainoyrgies fwnes (nea samples)? Einai poly wraios o hxos twn﻿ isokrathmatwn kai endiaferomai an einai kainoyrgia samples. Bravo pater an kai den se gnwrizw. [..YouTube..] Wraios O P. Nikodhmos . O isokraths einai o psifiakos? An nai einai , exete pesasei kainoyrgies fwnes (nea samples)? Einai poly wraios o hxos twn isokrathmatwn kai endiaferomai an einai kainoyrgia samples. Bravo pater an kai﻿ den se gnwrizw. [..YouTube..] Wraios O P. Nikodhmos . O isokraths einai o﻿ psifiakos? An nai einai , exete pesasei kainoyrgies fwnes (nea samples)? Einai poly wraios o hxos twn isokrathmatwn kai endiaferomai an einai kainoyrgia samples. Bravo pater an kai den se gnwrizw. [..YouTube..] Wraios O P. Nikodhmos . O isokraths einai o psifiakos? An nai einai , exete﻿ pesasei kainoyrgies fwnes (nea samples)? Einai poly wraios o hxos twn isokrathmatwn kai endiaferomai an einai kainoyrgia samples. Bravo pater an kai den se gnwrizw. [..YouTube..] Wraios O P. Nikodhmos . O isokraths einai o psifiakos? An nai einai , exete pesasei kainoyrgies fwnes (nea samples)? Einai poly wraios o hxos twn isokrathmatwn kai endiaferomai an einai kainoyrgia samples. Bravo﻿ pater an kai den se gnwrizw. [..YouTube..] Wraios O P. Nikodhmos . O﻿ isokraths einai o psifiakos? An nai einai , exete pesasei kainoyrgies fwnes (nea samples)? Einai poly wraios o hxos twn isokrathmatwn kai endiaferomai an einai kainoyrgia samples. Bravo pater an kai den se gnwrizw. [..YouTube..] Wraios O P. Nikodhmos . O isokraths einai o psifiakos? An nai einai , exete pesasei﻿ kainoyrgies fwnes (nea samples)? Einai poly wraios o hxos twn isokrathmatwn kai endiaferomai an einai kainoyrgia samples. Bravo pater an kai den se gnwrizw. [..YouTube..] Wraios O P. Nikodhmos﻿ . O isokraths einai o psifiakos? An nai einai , exete pesasei kainoyrgies fwnes (nea samples)? Einai poly wraios o hxos twn isokrathmatwn kai endiaferomai an einai kainoyrgia samples. Bravo pater an kai den se gnwrizw. [..YouTube..] Wraios O P. Nikodhmos . O isokraths einai o psifiakos? An nai einai , exete pesasei kainoyrgies fwnes (nea samples)? Einai poly﻿ wraios o hxos twn isokrathmatwn kai endiaferomai an einai kainoyrgia samples. Bravo pater an kai den se gnwrizw. [..YouTube..] Wraios O P. Nikodhmos . O isokraths einai o psifiakos? An nai einai , exete pesasei kainoyrgies fwnes (nea samples)? Einai poly wraios o hxos twn isokrathmatwn kai endiaferomai an einai kainoyrgia samples. Bravo pater an kai den se﻿ gnwrizw. [..YouTube..] Wraios O P. Nikodhmos . O isokraths einai o psifiakos? An nai einai , exete pesasei kainoyrgies fwnes (nea samples)? Einai poly wraios o hxos﻿ twn isokrathmatwn kai endiaferomai an einai kainoyrgia samples. Bravo pater an kai den se gnwrizw. [..YouTube..] Wraios O P. Nikodhmos . O isokraths einai o psifiakos? An﻿ nai einai , exete pesasei kainoyrgies fwnes (nea samples)? Einai poly wraios o hxos twn isokrathmatwn kai endiaferomai an einai kainoyrgia samples. Bravo pater an kai den se gnwrizw. [..YouTube..] Wraios O P. Nikodhmos . O isokraths einai o psifiakos? An nai einai , exete pesasei kainoyrgies fwnes (nea samples)? Einai poly wraios﻿ o hxos twn isokrathmatwn kai endiaferomai an einai kainoyrgia samples. Bravo pater an kai den se gnwrizw. [..YouTube..] Wraios O P. Nikodhmos . O isokraths einai o psifiakos? An nai einai , exete pesasei kainoyrgies fwnes (nea samples)? Einai poly wraios o hxos twn isokrathmatwn kai endiaferomai an einai kainoyrgia﻿ samples. Bravo pater an kai den se gnwrizw. [..YouTube..] Wraios O P. Nikodhmos . O isokraths einai o psifiakos?﻿ An nai einai , exete pesasei kainoyrgies fwnes (nea samples)? Einai poly wraios o hxos twn isokrathmatwn kai endiaferomai an einai kainoyrgia samples. Bravo pater an kai den se gnwrizw. [..YouTube..] Wraios O P. Nikodhmos . O isokraths einai o psifiakos? An nai einai , exete pesasei kainoyrgies﻿ fwnes (nea samples)? Einai poly wraios o hxos twn isokrathmatwn kai endiaferomai an einai kainoyrgia samples. Bravo pater an kai den se gnwrizw. [..YouTube..] Wraios O P. Nikodhmos . O isokraths einai﻿ o psifiakos? An nai einai , exete pesasei kainoyrgies fwnes (nea samples)? Einai poly wraios o hxos twn isokrathmatwn kai endiaferomai an einai kainoyrgia samples. Bravo pater an kai den se gnwrizw. [..YouTube..] Wraios O P. Nikodhmos . O isokraths einai o psifiakos? An nai einai , exete pesasei kainoyrgies fwnes (nea samples)? Einai poly wraios o hxos twn isokrathmatwn kai endiaferomai an einai kainoyrgia samples. Bravo pater an﻿ kai den se gnwrizw. [..YouTube..] Wraios O P. Nikodhmos . O isokraths einai o psifiakos? An nai einai , exete pesasei kainoyrgies fwnes﻿ (nea samples)? Einai poly wraios o hxos twn isokrathmatwn kai endiaferomai an einai kainoyrgia samples. Bravo pater an kai den se gnwrizw. [..YouTube..] Wraios O P. Nikodhmos . O isokraths einai o psifiakos? An nai einai , exete pesasei kainoyrgies fwnes (nea samples)? Einai poly wraios o hxos twn isokrathmatwn kai endiaferomai an﻿ einai kainoyrgia samples. Bravo pater an kai den se gnwrizw. [..YouTube..] Wraios O P. Nikodhmos . O isokraths einai o psifiakos? An nai einai , exete pesasei kainoyrgies fwnes (nea samples)? Einai﻿ poly wraios o hxos twn isokrathmatwn kai endiaferomai an einai kainoyrgia samples. Bravo pater an kai den se gnwrizw. [..YouTube..] Wraios﻿ O P. Nikodhmos . O isokraths einai o psifiakos? An nai einai , exete pesasei kainoyrgies fwnes (nea samples)? Einai poly wraios o hxos twn isokrathmatwn kai endiaferomai an einai kainoyrgia samples. Bravo pater an kai den se gnwrizw. [..YouTube..] Wraios O P. Nikodhmos . O isokraths einai o psifiakos? An nai einai ,﻿ exete pesasei kainoyrgies fwnes (nea samples)? Einai poly wraios o hxos twn isokrathmatwn kai endiaferomai an einai kainoyrgia samples. Bravo pater an kai den se gnwrizw. [..YouTube..] Wraios O P. Nikodhmos . O isokraths einai o psifiakos? An nai einai , exete pesasei kainoyrgies fwnes (nea﻿ samples)? Einai poly wraios o hxos twn isokrathmatwn kai endiaferomai an einai kainoyrgia samples. Bravo pater an kai den se gnwrizw. [..YouTube..] Wraios O P. Nikodhmos .﻿ O isokraths einai o psifiakos? An nai einai , exete pesasei kainoyrgies fwnes (nea samples)? Einai poly wraios o hxos twn isokrathmatwn kai endiaferomai an einai kainoyrgia samples. Bravo pater an kai den se gnwrizw. [..YouTube..] Wraios O P. Nikodhmos . O isokraths einai o psifiakos? An nai einai , exete pesasei kainoyrgies fwnes (nea samples)? Einai poly wraios o hxos twn isokrathmatwn kai endiaferomai an einai kainoyrgia samples. Bravo pater an kai den se gnwrizw.